Finally, on November 8th, the XVIII Chinese Communist Party Congress started, with more than 2.270 delegates from all over the country. The delay was allegedly due to the underground tactics behind the spectacular fall of mr. Bo Xilai, former member of the Politburo. The delay determined an interesting parallelism between the US elections and the epocal leadership transition in China. China unveils the Congress after 10 years of amazing development (check this wonderful graph by The Guardian): the GDP increased by four times, as well as the foreign investment outflow that reached 21,4 billion of USD. Urban population registered a +12% growth and the internet users became an ocean with more than half a billion people. Hu Jintao showed the main goals of the forecoming chinese strategy: to double the GDP and the average citizen revenue (providing a large scale healthcare), to fight the corruption with internal reforms and, finally, to maintain the supremacy and control of the central party. A wide range leadership transition is in progress: only the future Party Secretary and President Xi Jinping, and the premier candidate Li Keqiang will keep their position. 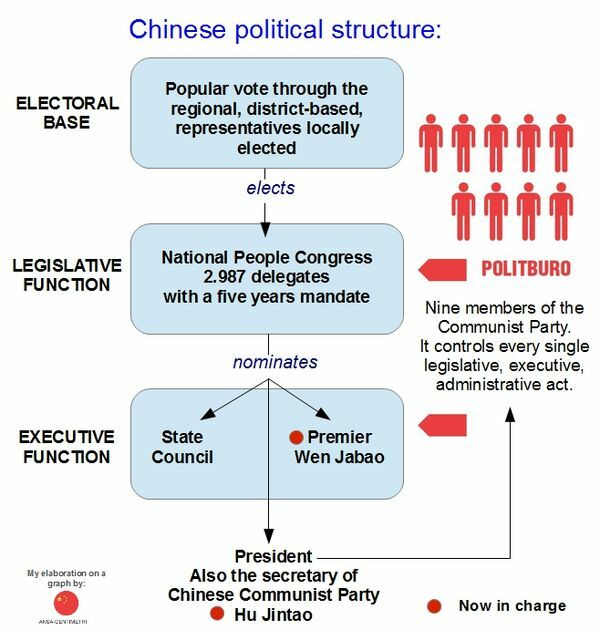 The Central Committee (320 members) will be renewed for a half; the Politburo that controls every legislative, executive and administrative act in China will be completely re-elected, together with its Permanent Committee. Major international columnists explained the complex power relationships [The Economist, Age Before Beauty], and the most important consequences for the present and future authorities [The Guardian, China looks to usher in the new generation of Communist leaders]. But the struggle has just started between the so called Shanghai gang with top neo-maoist politicians close to the former President Jiang Zemin, and the liberals (for the Chinese context of course!) inspired by the incumbents Hu Jintao and Wen Jabao. It seems that many columnists agree that Li Keqiang and other political figures close to him will be the next top players, representing a good trade-off between the two souls of the Party influencers. Only the Congress will generate the future face of the new China, dragging in a totally new political arena the country’s most important priorities: the Go West programme, the strategies promoting the national demand to overcome the present export-oriented economy, the geopolitical role, and the struggle between Guangdong and Chongqing models (previously mentioned here). If you remained awake for the US elections (at least in Europe! ), a glance at the Chinese transition deserves a tough insomnia!